NMM 3000. 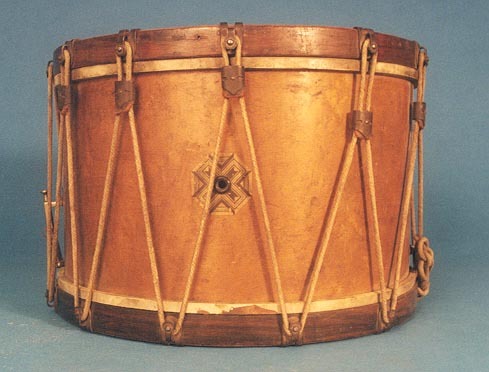 Side drum by Lyon & Healy, Chicago, ca. 1906-1930. Paper label inside drum: Lyon & Healy / Factories, Healy Station / Warerooms, Wabash Ave. and Adams St. / CHICAGO. The Monarch No. N56. Maple shell, natural finish, decorative eight point star inlaid around the vent hole. Twelve leather tugs. Wood rims, each with twelve metal roller hooks through which the rope passes. Arne B. Larson Collection 1979.